Here a remake of this topic, it seems it was removed because it was in the old Welcome section of this forum, but it is good I have a backup of it all.. It would of been nice if someone could of warned me about it, it's the least I would expect, anyways, here it is for one last time. 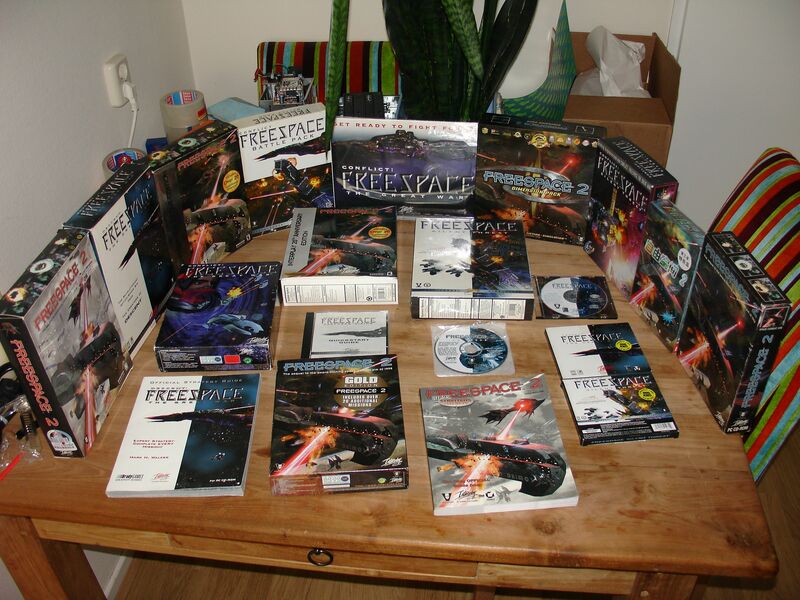 During my time away from here, I been collecting Descent & Freespace games mainly and miscx items that too are a part of them, even I began collecting these since the beta version of Descent 1 was released on october 24, 1994, since that day I was hooked to the series and I wanted every version of it and i mean every single one. So after a good friend of mine on facebook passed me information of this new Descent, a game series I have been collecting the past 20+ years, I was really surprised! This new Descent was named Descent Underground, this game is lead by Eric "Wingman" Peterson and some others from the Star Citizen Project that is now lead by Crhis Robberts. Sometime later also Overload came by, Overload is made by the original Descent 1,2 3 & Freespace game series programmers. The reason for me being so surprised is that I have been collecting the original Descent & Freespace game series since October 24, 1994 and seeing a Descent 4 like idea pop up even being a prequel, well I am willing to support his project as well and I really really hope you lot will succeed. So here my story and my Descent/Freespace collection, something most of the Descent &amp; Freespace community people know about, I just want to give you lot my insights of the best game ever created by mankind. After some years of collecting and being a Pyro Jockey for over 20 years all way back since it all began on October 21, 1994 when the first Descent Demo rolled out I was hooked immediately, and since then I waited for every part of the series to arrive but never thought about this collecting feeling which I started about 2 years ago and now it has turned into a Descent obsession some call it Obi's Descent Archive and others a museum heh. Anyways name it what you all like here's some new pics and I want to thank a lot of you for helping get a few of these rare wanna haves. I gave each album a new sub section so here's the collection 105 parts as I have counted them all yesterday after adding a Descent mission disc and a Spacetec IMC Cooperation Spaceorb 360 game controller . What I did is divide it all in to sub groups, all the Product names speak for themselves, click it and you enter the sub gallery of that item . That frame hung in the Interplay HQ Office hallways, them CD-R's are host software of Descent 1 and 2, the one with the scratches is the Descent 1 Alpha disc, this is where it all began before it was going final, the one from 1996 is the host disk for Descent Anniversary Edition me thinks hence the date of the disk, unless some Interplay Employee's can help me out here! Pic is from the seller, I will make a better documented photography of this odd item. Patented SENSITIVE FORCE n TORQUE technology built into the SpaceOrb™ 360 PowerSensor ball senses up all the pushes, pulls and twists that you apply among the axes and translates them into fluid and smooth movement in your game - with over 1,000 levels of speed! Think of the PowerSensor as your head, and move the head in the way you want to move on-screen. To move forward, just push with your thumb on the back of the ball (or head), and youll move down the hallway. To move backward, pull from the front of the ball, and you'll go back. To look left or right or spin, twist the ball from side to side and you'll look or spin on screen. This Interesting controller was especially designed for any 6DoF based game, the Descent and Forsaken series were famous of this 6DoF technique being used. Adding a true DIGITAL interface through a powerful serial port and how fast and how slow you move in your game depends on how much force you use on the PowerSensor ball. To move forward slowly, lightly push the ball forward. To move faster, increase the pressure until you reach top speed. The SpaceOrb is a 10-bit device allowing for over 1,000 levels of speed. With the Customizer, you can fine tune axis sensitivity exactly to your needs. You can even adjust the sensitivity of EACH AXIS with our new GameMaster software. The Spacetec Space orb 360 is a real worthy item for the World's Largest Descent / Freespace collection, this way it will keep on growing and hereby I also increase our nice descent / Freespace Reference. So now I need an Orb Shield with an Arduino Module and then I can use the Space Orb 360 in Win7Pro x64 + SP1 with new games. Anyways that is about it from my part alongside Descent & Freespace collecting I build Multcore Dual CPU based server/workstation system, I am 2CPU Hardware Moderator @ 2CPU.com as Gold Leader. Anyways II can go on, but I think I will keep it to this for now and I really look forward how this project will unfold. My favorite of all time is Dimensions for Descent Factory Sealed which is extremely rare it also has the original price tag on the box, even being this was a map disk of 75 D1 maps made by D1 fans across the world , there is also Levels of The World but that is something more common that this beauty. Also I backed Descent Underground with a sweet 250 USD Pledge as Backer #3144! Descent II: The Infinite Edition USA 1997 Factory Sealed! Still new in Cellophane Shrink Wrap! Overload by Revival Productions ! I pledged 50USD via Drakona with PayPal and she credit carded the money to their Kick Starter page. Although I never got the game, so I don't know what happened there... I hope it comes around then. Anyways the backup is here and nothing is thankfully gone lost. Wow, my collection consists of ... this game on Steam. I've never played the older games at all. Always an impressive sight, no matter how many times I've seen it. As the collection goes I have not added new items in ages really, if I do see something I'll add it but I guess there will be moments that there isn't much to find at all. Ah well always looking out to find new items. this is the most complete archive of Descent & Freespace games and I am proud to have gotten this far as it's contents goes. What days were those? I played a little bit on Kahn back in the day, but I was probably most active during D3's PXO days. When D2 came out I was 12 and had very limited net access! Dial-up Modem games were more of a thing until we got DSL (as in the kind where you dial your friends number and you play together, not dial-up internet). I had Dual IDSN Fritz Card PCI was great for 16kb per sec up/down, only downer was doble telephone costs lmao. this back in 1997-1999, fun times that were. But before that I had a 33K6 model from 3-Com from 1994 to around 1996, got IDSN then went Dual IDSN in 1997. I wouldn't mind rebuilding my collection of Descent titles at some point. About 10 years ago I sold a bunch of old boxes including a D1 original during a scrounge for cash. I must have been mad. I wonder if charity shops are good places to find old games? Well I kind of stopped Collecting Descent & Freespace games i have 11 items now and just lack of space and money, I am keeping on what I have collected tho, since it is well worth holding on to, for now anyways.